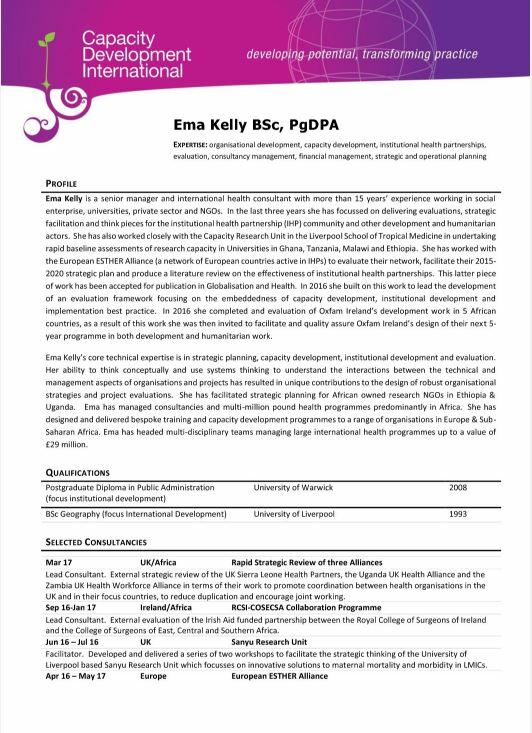 Ema Kelly is a senior manager and international health consultant with more than 15 years’ experience working in social enterprise, universities, private sector and NGOs. In the last three years she has focussed on delivering evaluations, strategic facilitation and think pieces for the institutional health partnership (IHP) community and other development and humanitarian actors. She has also worked closely with the Capacity Research Unit in the Liverpool School of Tropical Medicine in undertaking rapid baseline assessments of research capacity in Universities in Ghana, Tanzania, Malawi and Ethiopia. She has worked with the European ESTHER Alliance (a network of European countries active in IHPs) to evaluate their network, facilitate their 2015-2020 strategic plan and produce a literature review on the effectiveness of institutional health partnerships. This latter piece of work has been accepted for publication in Globalisation and Health. In 2016 she built on this work to lead the development of an evaluation framework focusing on the embeddedness of capacity development, institutional development and implementation best practice. In 2016 she completed and evaluation of Oxfam Ireland’s development work in 5 African countries, as a result of this work she was then invited to facilitate and quality assure Oxfam Ireland’s design of their next 5-year programme in both development and humanitarian work. Ema Kelly’s core technical expertise is in strategic planning, capacity development, institutional development and evaluation. Her ability to think conceptually and use systems thinking to understand the interactions between the technical and management aspects of organisations and projects has resulted in unique contributions to the design of robust organisational strategies and project evaluations. She has facilitated strategic planning for African owned research NGOs in Ethiopia & Uganda. Ema has managed consultancies and multi-million pound health programmes predominantly in Africa. She has designed and delivered bespoke training and capacity development programmes to a range of organisations in Europe & Sub-Saharan Africa. Ema has headed multi-disciplinary teams managing large international health programmes up to a value of £29 million.